Houston sculptor Joe Mancuso transforms rough timber into elegant geometry. Dallasite Linda Ridgway models natural fiber and leaves into sensual artifacts. "Essentials," the current exhibit at the Glassell School of Art, gathers works by Mancuso, Ridgway and four other Texas artists - David Darraugh, Bill Davenport, David Szafranski and John Wilcox - in a display of contemporary minimalist art. At its most basic, minimalism divests art of any and all things extraneous to form. There is no subject, no embellishment, no emotion, no content. It is a rigorous intellectual aesthetic most often expressed either as pure geometry (in three dimensions) or as flat, unmodulated and monochromatic painting in two-dimensional formats. Minimalism emerged in the late 1950s as a reaction against the spiritual and emotional qualities associated with abstract expressionism. It became increasingly intransigent as artists reacted to pop art and its commercial sources. Sculptors Donald Judd and Carl Andre, and painters Robert Mangold and Barnett Newman emerged as the leading proponents of its austere, cerebral principles. A generation later, some of minimalism's hard edges have softened. Materials - at first exclusively industrial, such as aluminum - now may be organic and, in turn, elicit more sensual responses. But "getting it" is still a mental rather than a sensual process. Mancuso's elegant "Pool" consists of oval-shaped components of wood arranged in a perfect circle. Though visually appealing, like a beveled-glass puzzle, the impact of the piece is primarily conceptual. Considerations of scale and proportion are richer in their rewards than mere admiration of the grain and color of the woody material. On the other hand, the precision of the milled shapes, and the shapes themselves, are the sum of the piece. There is no hidden meaning, no sub-surface content or emotional timbre. Szafranski, a 1989 graduate of the University of North Texas in Denton, weaves industrial tapes into abstract geometries. 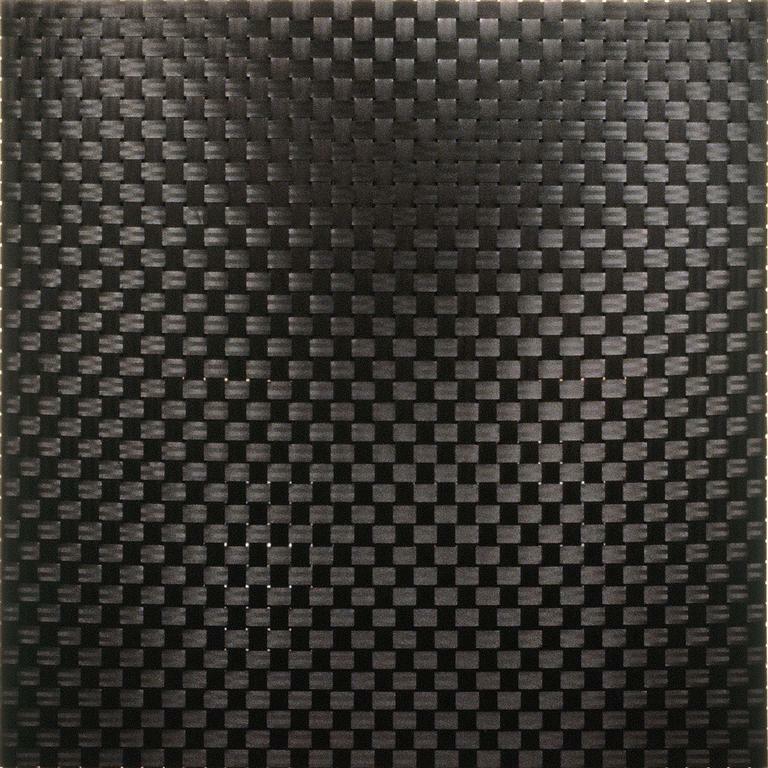 Two of his works, made from common tape and webbing, create chromatic impressions and textural patterns within the rigors of nonobjective art. He wove the strips of material in classic over-under manner; they are mounted on stretcher bars and measure 8 feet square. They hang side by side and, though their essential components are identical, their impacts are dramatically different. One, woven from black polyester webbing, absorbs and reflects light, allowing visual penetration and simultaneously preventing it. Depending on the viewing angle, the horizontals or the verticals dominate. The second piece is made of aluminum tape, like duct tape, whose dull sheen deflects visual concentration. Ridgway stands a little apart from her male colleagues. Her works, especially the installation piece "Feast or Famine," possess a distinctive organic quality. In this work the artist attached 44 components, resembling sweet potatoes standing erect, in perfect alignment on the concrete floor and at a 45-degree angle from the nearest wall. Each has been shaped from hemp and concrete tinted to naturalistic shades of brown. None is taller than 12 inches, and all clearly bear the marks of the artist's hands as she rolled, squished, pressed and pinched the raw material. The evocative qualities of "Feast or Famine" depend on the viewer's literal point of view. From a normal standing position, for example, one looks down on the make-believe tubers, perceiving in an instant their persuasive natural appearance and the improbability of their upright position. The distinctive shapes, emerging as they seem to from the floor, do not so much defy gravity as suggest an upside-down world where roots grow above ground - or, perhaps, where the viewer finds himself underground. Where: Glassell School of Art, 5101 Montrose Blvd., 639-7500.